Come See Us & Tour The Distillery! It is with immense pleasure and pride that we opened our distillery in late summer of 2016. Williamson County, Tennessee has long been known for its rich cultural and geographical heritage. Many of our early settlers in this county were of Scots-Irish descent, having traveled west through the Cumberland Gap and over the Appalachian Mountains, from Virginia, North Carolina and South Carolina. Many of them crossed these mountain passes with their stills on their backs, bringing with them the time-honored tradition of creating hand-crafted small batch whiskey. It is with this same spirit of independence, fortitude, and perseverance that we strove to bring Leiper’s Fork Distillery to life. It is our aim to resurrect the lost history and heritage of small batch whiskey production in Williamson County. In a world of mass production and corporate fads, it is our goal to achieve long-term authenticity by using age-old traditions, paying attention to every detail, and carrying unquenchable passion for the whiskey we produce. To that end, Leiper’s Fork Distillery is creating high-end premium whiskeys using local ingredients and pure limestone filtered water, resulting in superior whiskeys with a signature taste. Thank you for your time and interest in Leiper’s Fork Distillery. We are excited and honored to bring back this lost art and industry to a county that has always put its history and heritage at the forefront. Because of this, it is our pledge to our distilling forefathers and patrons to pour our heart and soul into every drop of whiskey we make from grain to glass. Leiper's Fork Distillery is partnering with the community to bring back the history and heritage of small batch whiskey production to Williamson County. We are crafting premium spirits using local ingredients and limestone filtered water to create a superior product with a signature taste. This has opened the door for Leiper's Fork Distillery to join an emerging niche of artisan distilleries who will never compromise quality or taste. The Leiper's Fork Distillery will be characterized primarily by a low volume, low impact concept of production. 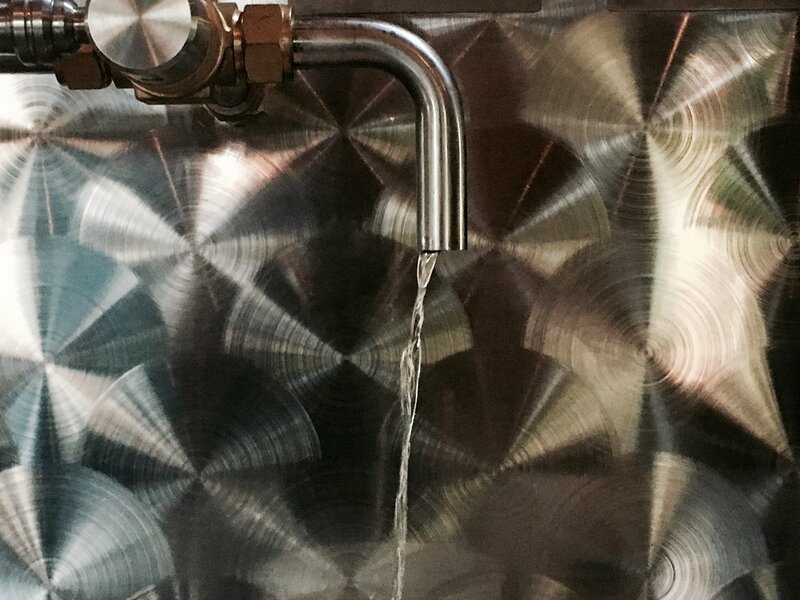 This allows us added attention to detail in order to create our signature premium spirits. At Leiper's Fork Distillery we are passionately committed to creating superior whiskeys with signature taste. For our proprietor, Lee Kennedy, one could argue this is a culmination of a passion that has been simmering for over 20 years. Lee's relationship with whiskey began the same way it has for most native rural Southerners. Bourbon, Tennessee and Moonshine whiskey have been a part of the fabric of the South for hundreds of years. Growing up here, everyone knew who made the best moonshine and where to quietly get it. It was not a mass marketed fad, but just a part of everyday life. Most of our fathers drank bourbon, not because it was trendy, but because they wouldn’t contemplate drinking anything else. We have assembled a team of individuals that share a passion for the history and heritage of Tennessee whiskey. Typical of many small batch distilleries, we are family-owned and operated, including his mother, brother and uncle. Our backgrounds range from the 3rd great granddaughter of W.L. Weller to long-time loyal friends who have supported each others dreams at every step and have the same passion for creating a product that will warm and thrill the palate. We won’t tell you our great grandfathers came to us in a dream and taught us how to make whiskey, but we will strive every day to produce quality, high premium spirits with all of our energy and resources. Our two core spirits under production are Tennessee Whiskey and Bourbon. We use locally grown grain, limestone filtered water, traditional techniques and attention to detail to create these premium small batch whiskies. 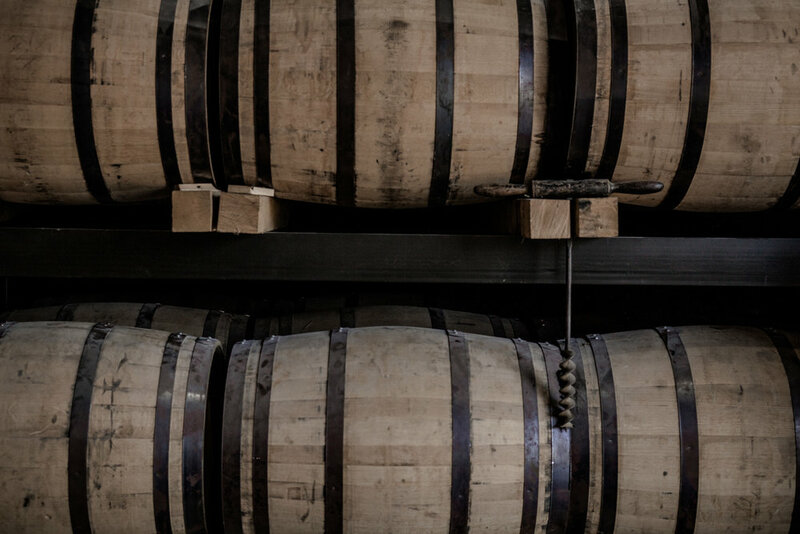 Our whiskey is aged in 53 gallon charred white oak barrels for five to seven years; maybe longer. Our retail store is located in a 200 year old log cabin built by one of the mid states early settlers. As part of this retail area we have a tasting room accommodating up to 25 people per tour. Our still is a 5000 sq. ft. timber frame building sitting directly behind our retail space, housing our 500 gallon swan neck whiskey still and cypress fermentation tanks. 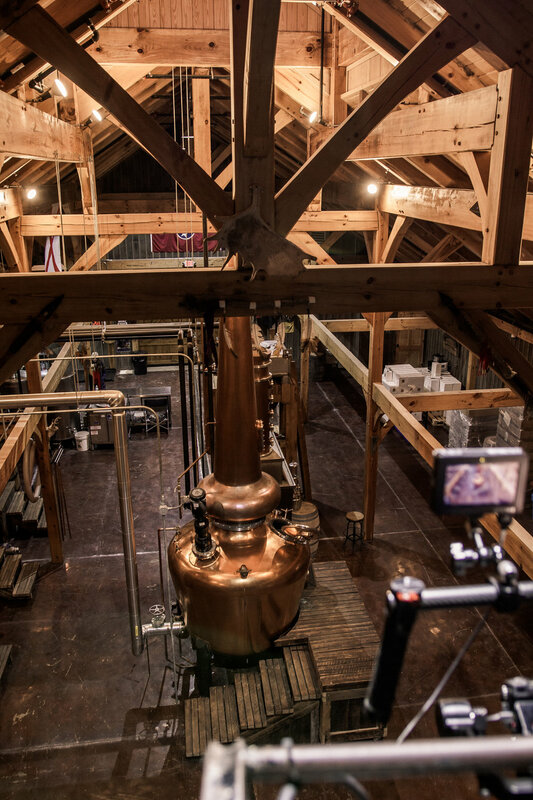 The look and feel of our distillery harkens back to an era before the industrial revolution when large wooden structures were used as commercial spaces. Leiper's Fork Distillery sits on 27 rolling acres just outside the historic village of Leiper’s Fork. Middle Tennessee has a rich but nearly forgotten history of whiskey distilling. In 1799, John Overton, serving as Supervisor of the Internal Revenue for the District of Tennessee, performed a General Accounting of Stills, and found that there were 61 stills servicing the 4,000 inhabitants of Davidson County. As land began to open up to the south and west many of these people began to settle along the Harpeth River Valley in the newly formed Williamson County. Many of these early residents to our county naturally brought their stills with them as they moved. In this early period of our county’s history, whiskey production was small in scale and conducted by individuals. As part of a farming operation, and true to their cultural traditions, many farmers fermented and distilled their excess grains in the form of whiskey. In those days, whiskey was used not only as a libation but was also used for medicines, disinfectants, an ingredient in perfumes and even as a currency for bartering. By the mid 1800s, small commercial distilleries began to dot the landscape. In our area, the Boyd family operated a grist mill on the West Harpeth River and a distillery at the head of Still House Hollow. Colonel Henry Hunter, who originally owned the property where Leiper’s Fork Distillery resides, operated a small distillery on Old Hwy 96, just outside the Village of Leiper’s Fork. In county records, this piece of property was called the “Distillery Tract”. Early distillers in the area would float flatboats full of whiskey barrels to Natchez, MS or New Orleans, LA, sell them for twice the price as in Davidson or the newly formed Williamson County then walk back on the Natchez Trace home. Colonel Henry Hunter, former distiller and major property owner in Leiper's Fork, including the land where Leiper's Fork Distillery sits today. As time passed and the Industrial Revolution began to emerge, distilleries began to become more technologically advanced, slightly larger in size and fewer in number. In 1886, the Nashville Union reported that the distilling industry was the largest manufacturing industry in the state. By the turn of the 20th century, Williamson County followed this trend, having only one legal distillery which made approximately 150 gallons of spirit per day. This was the J.H. Womack & Bro. White Maple Distillery. The White Maple Distillery was owned and operated by John H. and Towns P. Womack. Both brothers were born in Lynchburg, Tennessee in the 1860s. The Womack’s operated a grist mill in Lynchburg and were contemporaries of the Tolley, Motlow and Daniel families in Lynchburg. It was from these prominent distilling families that they learned the distilling craft. According to the federal census, by 1900 the brothers had moved to Franklin, in Williamson County, Tennessee. 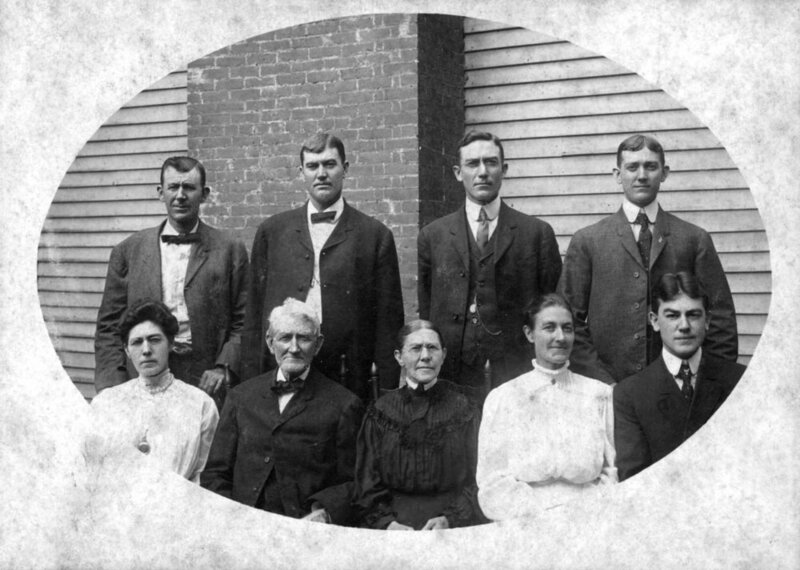 The two gentlemen standing in the back on the far left established J.H. Womack & Bros. White Maple Distillery, John H. and Towns P. Womack ran their distillery from 1901 to December 31, 1910. Located on the corner of Boyd Mill & 11th Avenue, they had a granary, still house, cooperage, barrel house, office and hogs to eat the left over stillage. On this census their occupation was listed as “Saloon Keepers”. The White Maple Distillery began operation in May of 1901. The distillery produce two barrels of whiskey per day until they were forced to close in 1910. White Maple Tennessee Whiskey was distributed extensively throughout Tennessee and Northern Alabama. History and time, however, were not on the brothers' side. The distillery only operated for 9 years, closing when Tennessee enacted it’s own statewide Prohibition in 1910. An article on the front page of the Tennessean newspaper, dated December 31, 1909, reads, “Distilleries and Breweries Must Close Tonight”. At midnight on this date 41 distilleries shut their doors across the state. Many Tennessee distillers ran their last batches right up until midnight. With the stroke of a pen, Tennessee’s 100 years old legal whiskey industry was wiped away. Many TN distillers moved their operations to Kentucky, but in 1920, when federal Prohibition was instituted by the Volstead Act, they too were forced to shut their doors. Prohibition was not the end of the whiskey industry in Williamson County. Illegal or untaxed whiskey production had always been prevalent in the hills and hollows of our county and, with the implementation of prohibition, increased dramatically. It has been said by local old-timers that every spring in the county had an illegal still on it at one time or another. The natural limestone filtered spring water in our area, which is inherent to the famous whiskey making regions of Scotland, Ireland, Kentucky and Tennessee, produced some of the finest illegal whiskey in the country. The infamous Williamson County Whiskey Ring shipped their local moonshine from this area to city centers such as Nashville, Cincinnati and Chicago. Sam Locke, the 3rd great uncle of our proprietor, Lee Locke Kennedy, was a revenuer in Williamson County during the Prohibition era. On Saturday, March 7, 1925, as he unlocked the gate to his family farm, he was gunned down by hired henchmen of the Williamson County Whiskey Ring. He had done his job a little too well, and in the course of a 3 month time-frame had busted more than 73 illegal whiskey stills in the county. This brazen act shows the deadly seriousness with which these illegal distillers guarded their profits and livelihoods. As you can see, Tennessee and Williamson County has had a rich and colorful past when it comes to the manufacturing of whiskey. 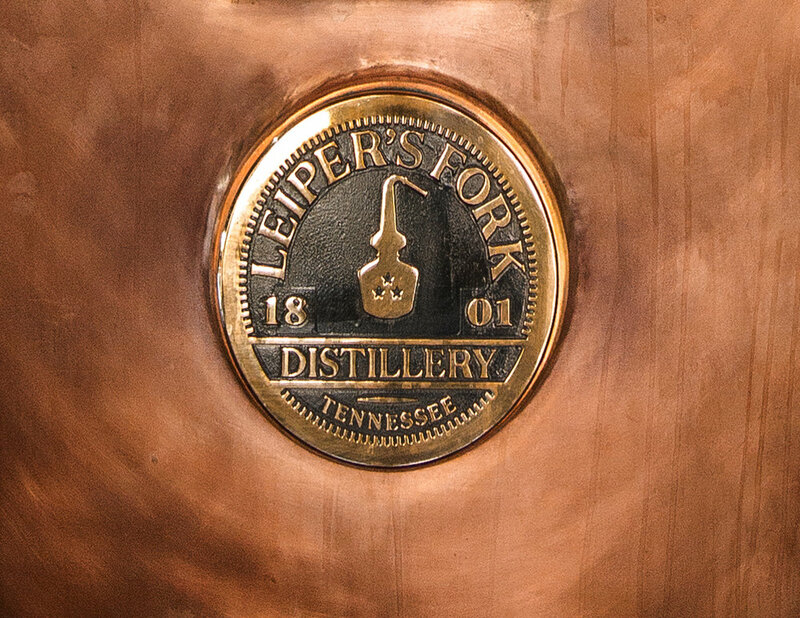 Here at Leiper’s Fork Distillery, we are honored to help usher in a new era of distilling to our county. Today, as we view the distilling landscape locally, it seems more akin to the period of the 1850s, when small batch, locally owned distilleries were producing quality spirits from local ingredients. For us, this is an exciting time of renaissance in whiskey production for the county and we are privileged to be a part of it. Our circa 1820-1825 cabin built by James Daniel from Yellow Creek (VanLeer) in Tennessee houses our gift shop, tasting room and offices. We are endeared to whiskey because it represents a tangible link to our past and those whocame before us. It is a testament to the value of patience and age-old traditions in a world of modernity and instant gratification. It is the earthy smell of our soil, from whence our corn is grown; it is the taste of our limestone pure water that subtly enhances our mash. From bitter winter mornings to sultry summer nights it is the breath of our air that surrounds and moves through barrels slowly maturing our spirit year after year. For to taste a drop of carefully crafted whiskey is to experience and consume the very essence of the land and surroundings from whence it was born. Now you can purchase the same gear we sell inside our still house shop in Leiper’s Fork, Tenn. Enter Our New Online Storefront! Sign up to receive distillery news and updates as they happen!